According to the W3C definition, a "WebService" is "a software system designed to support interoperable machine-to-machine interaction over a network. It has an interface described in a machine-processable format (specifically Web Services Description Language WSDL). Other systems interact with the Web service in a manner prescribed by its description using SOAP messages, typically conveyed using HTTP with an XML serialization in conjunction with other Web-related standards." The primary purpose of a webservice is to manipulate XML representations of Web resources exposing an arbitrary set of operations. 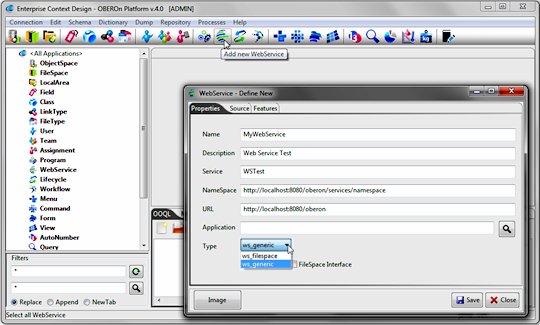 OBEROn (since version 1.3) employs Apache CXF to generate the WSDL and to expose/execute the webservice methods. OBEROn can act both as service provider than service requester. Users enabled to manage WebServices (see user access rights ) can create a new instance by clicking the "Add new WebService" button from the "Context Design" menu and compile the relative form. 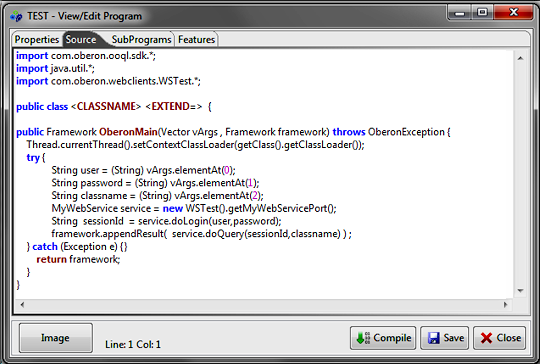 Name: is the OBEROn internal name (the administration object name) for the webservice and represents also the generated java class name. NameSpace: is the namespace URL for the webservice; a namespace is a context for identifiers and contains items which must have unique names. Items that appear in namespaces have a short (local) name and unique long "qualified" names for use outside the name space. URL: the application server URL where the webservice will be published; if not specified, the client takes the default parameter from the oberon.ini configuration file. 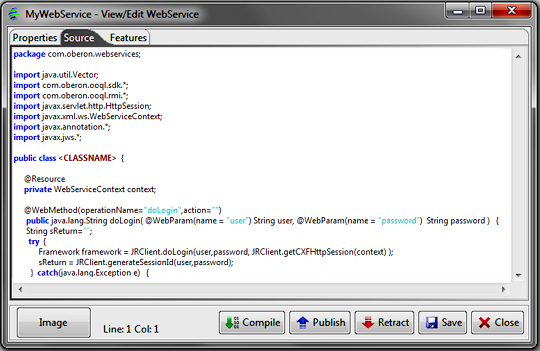 Refer to the "Webservice Interfaces" section to know how to write the webservice code. 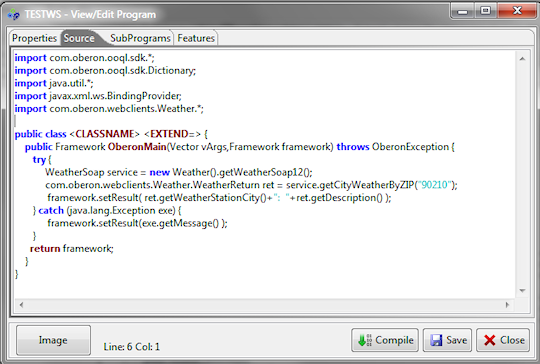 Once the webservice object is created, you can re-open its definition form and write/compile the code. At the end of this process you can decide to publish the webservice class into the application server for a specific OBEROn web-application (referenced by the URL). 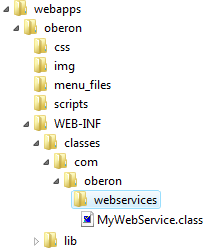 WEB-INF/classes/com/oberon/webservices folder of the web-application and edit the WEB-INF/cxf-servlet.xml file for registering the webservice parameters. 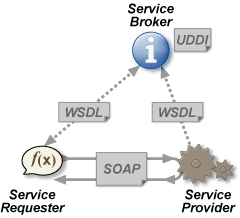 The WSDL describes all the available methods and the way to access them; the download of the WDSL from the specified address lets you to create SOAP clients and to perform the web-service's operations. generates all classes which are immediately ready to be applied into OBEROn programs or triggers. You can also employ the generated SOAP client classes inside the range-programs or trigger-programs to retrieve field-ranges from another machine over the network or to perform some checks "on-line". The clientgen command supports also the old RCP web-services: in this case, the client classes are generated by Apache Axis 1 instead of CXF.